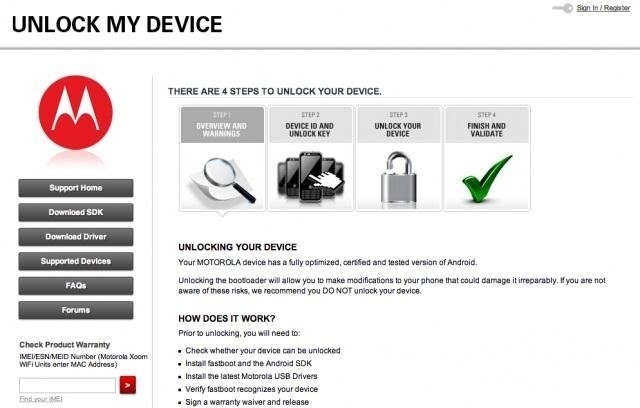 Motorola launched a new webpage on Friday that tells Android users how to unlock the bootloaders on a limited number of new Motorola smartphones and tablets. This new 'Unlock My Device' page helps demystify the process and make it easier for users to customize their phones. The company plans to make more of its devices unlockable in the future, depending on the carriers, but right now it's just basically the XOOM tablet, new Photon Q, and RAZR developer edition. Motorola announced this plan over a year ago, which came as a surprise to many because until then they had been less than accommodating to the idea of unlocking their devices. "You reboot into fastboot and get a token (you'll need the Android SDK installed, of course), feed that token back to Motorola, which gives you yet another number to repeat back." Of course, as with any other method of unlocking, this will make your warranty completely void and any problems you have after you do this will be greeted with an answer of "You're on your own." But if you're willing to take the risk (and know what you're doing), unlocking your phone or tablet gives you a lot more freedom on what you can do with it. Be sure to check this page for updates on which devices are supported. Want to unlock an iPhone or another device that's not on the list yet? Check out one of our many tutorials.